Before you make the investment in a new mattress and/or foundation, take the time to consider all your options. Trust us; it will all pay off in the end. Regardless of how much you’re looking to spend, or how much you’re hoping to save, knowing the facts, features, benefits and policies is the best way to start your shopping experience. What type of mattress do you want? There are several options on the market today, including basic innerspring, pocketed coils, memory foam and latex foam. What level of comfort would you like? Just as you’d find when selecting a pillow, mattress are available in a plethora of comfort levels, from extra plush to super solid. Set a budget, but keep your options open. There’s no reason to overpay for a mattress set. However, you may find an amazing value just outside your price range. Try it before you buy it. Take a minute or two (or fifteen) to truly relax and get the feel of the mattress you’re interested in. Spring or memory foam. “Visco Elastic”. This is the latest technology now at incredible / affordable prices. No springs! Just luxurious “Space Age Astronaut” Memory Foam – The finest for a fabulous feel! No motion transfer, excellent lumbar back support, total body conformity that relieves pressure points. Queen or King size mattress. Making a decision between a queen or king size mattress is a matter of personal choice. A queen bed is 60 inches wide by approximately 80 inches long, which is perfect for couples who prefer to be close together. King beds are 76 inches wide by 80 inches long and the best choice for couples that want maximum personal space for sleeping. California king is the longest bed – 72″ x 84″. Mattresses are manufactured in several sizes. The most common size mattress are below. Ask about our policies as well as our delivery and mattress removal services. Brands of mattresses: Sealy, Serta, Simmons, Beautyrest, Tempur-Pedic, Posturepedic, Spring Air, Englander, Cannon. Incline Mattress offer leg elevation or body elevation. Patented technology used in over 5000 hospital for maximum support. Provides gentle lift to elevate the body. 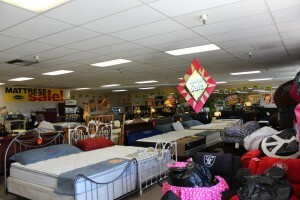 Mattress Warehouse with hundreds of mattresses in stock. SAVE! SAVE! SAVE as never before!!! Twin mattress $69, 89, 99, 119, 139, etc. Full mattress $99, 139, 169, 199, 249, etc. Queen mattress $149, 199, 249, 299, 349, etc. King mattress $249, 349, 499, 599, 699, etc. Some mis-matched but at this price who cares? Below wholesale! Save hundreds! Hurry in! from the famous discounter “MATTRESS WAREHOUSE”! Nobody beats our prices!!! Northern California headquarters for name brand close-outs, overstocks, surplus, special buys of one-of-a-kinds, floor samples, mis-matches, display models, odds & ends. Large selection on display – full warranties. Serving you proudly for 23 years at this location!